We all know that AI is creating new opportunities in every sector be it healthcare or travel. So, companies all around the world are enchasing on such opportunities to offer much-improved products or services to consumers through mergers and acquisitions. Let’s have a look at some of the most recent and significant mergers and acquisitions in the field of AI. GitHub was acquired by Microsoft for $7.5 billion. Somehow, the engineers’ network is stunned and to some degree baffled. Nat Friedman, Xamarin’s former CEO will now hold GitHub’s CEO position. The entire agreement of this acquisition will be finished by the end of 2018, subject to administrative auditing and standard closing conditions. DataFox is a San Francisco-based startup which analyses huge amounts of data to make predictions about enterprises through a data engine which is deployed on a cloud-based AI software. Oracle Cloud Applications will be integrated into DataFox, to add an extension of AI inferred company-level data and information which will help customers to make better decisions and hence better business outcomes. Microsoft acquired Semantic Machines in May 2018. Planning to additionally explore conversational AI, Microsoft will use the startup’s remarkable utilization of machine learning which enables clients to collaborate with data in a more normal manner. Microsoft aims at deploying such conversational AI to enhance its smart assistant Cortona. Velostrata is an Israeli- based startup which Google acquired for an undisclosed amount. Velostrata deals into enterprise cloud services wherein they help enterprises migrating their data to the cloud. Velostrata will join cloud team of Google in Tel Aviv office. Eyal Manor, VP Engineering at Google Cloud, emphasized that this acquisition will be an addition to their wide portfolio of migration to help ventures in their adventure to the cloud. Vertex.AI have created a deep learning engine, an open source named as PlaidML, which helps developers to install AI across various devices. Vertex.AI will now be a part of Intel’s Artificial Intelligence Products Group which was formed in 2017 with the aim of bringing its AI endeavors into a solitary association. PlaidML will be integrated with the Intel nGraph backend. Datorama is an Israel-based company which provides AI driven marketing analytics and intelligence data to enterprises. Datorama clients include PepsiCo, Ticketmaster, using data analytics to enhance their marketing campaigns. Through this acquisition, Salesforce’s Marketing Cloud capabilities will broaden up. Ring is an intelligent doorbell company which is acquired by Amazon for more than $1 billion. Ring basically manufactures doorbells. It also records live videos and sends to customer’s mobile phones. Ring has raised till date $209 million in funding. This is one of the third AI acquisitions made by Microsoft in 2018, straight away acquiring Lobe for an undisclosed amount. Lobe comes from Silicon Valley which basically develops a visual tool which can be used by developers to set up, train and then send deep learning software into their apps, that too, without writing any code. The founders of the company aim to create Lobe as an independent service, supporting open source guidelines and various platforms. They’ll be leveraging Microsoft’s worldwide framework, experience and AI research for building tools for developers. With this acquisition, Microsoft plans to make machine learning more approachable. BroadSoft is based out of Maryland which is acquired by Cisco for $1.9 million. BroadSoft deals in cloud-based calling and contact centre solutions. BroadSoft went public way back in 2010. Cisco will use this technology onto its hardware, meeting, calling and services range. After Semantic Machines, Microsoft acquired one more AI startup. Bonsai is based out of California which builds a broadly useful, profound fortification learning stage for ventures to use with modern control frameworks, for example, mechanical technology and robots. The framework was intended to give any designer access to AI systems paying little respect to their level of skill. According to Mark Hammon, CEO, Bonsai, the stage will shape some portion of Microsoft’s Azure AI services. Nobody can’t stop Google, as they acquired the most popular data science platform Kaggle and Halli Labs. Kaggle is a massively well-known stage for the data science network to talk about issues, best practice and takes part in quizzes some of which are posted by expansive companies and accompany seven-figure prize cash. It’ll be access to this network of ability that Google will hope to use. Halli Labs is based out of Bangalore which works on machine learning and deep learning systems to address what it portrays as “old issues”. Data science termed as the best job of the 21st century, data science companies are getting acquired constantly. One addition was made by Oracle when they acquired Datascience.com. It is a platform that brings together data science devices, framework and activities in a completely regulated work environment. According to Amit Zaveri, the official VP of Oracle Cloud Platform, this platform will empower clients to utilize the single data science stage to use huge information and machine learning for prescient learning and upgraded business results. 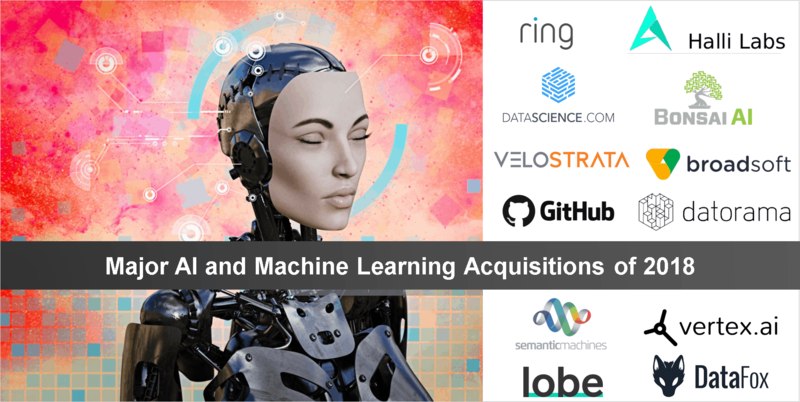 These are only a few of the major acquisitions in the AI field. Since 2017, AI field has witnessed many mergers and acquisitions like PayPal acquired iZettle, Workday acquired Stories.bi, ServiceNow acquired Parlo and VendorHawk etc. AI being evolutionary in nature, top companies acquire AI startups to enhance their existing products and services with the only aim of giving enhanced solutions to clients. However, more such acquisitions and mergers will take place in the coming years.